In just the franchise's second appearance in the World Series, and first as an AL team, the Houston Astros are the World Series Champions! 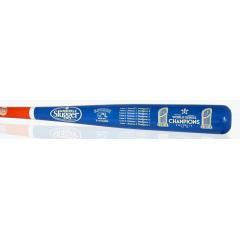 This full-size, Louisville Slugger World Series two tone bat is custom made and engraved to honor the 2017 World Series Champion, Houston Astros. Celebrate this great season by adding this unique collectible. These hand-crafted bats are made in America, and look great displayed in your home or office. Order yours before they are gone.